← Losing our religion? Or growing a new global one? eGaia 2nd edition and also new video! This is a big day for me. After a long gestation, I’m releasing the second edition of my book, eGaia, Growing a peaceful, sustainable Earth through communications, and also a 10 minute video, After the Crash: From chasing money to choosing community. 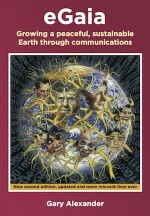 The book is available in print (eco-friendly print-on-demand publisher), FREE as an eBook. Everyone who knows me, knows I’m always enthusing about this new vision that I think is growing rapidly all over the world, of a new community-oriented, but globally connected, environmentally-sound society. I’m always meeting people who share this vision, going to places where they are trying out beginnings, and events where people are figuring out how to do this. The video, After the Crash: From chasing money to choosing community is a short, entertaining introduction to this vision. Please let me know what you think about it. Would you be willing to host a showing to friends with a group discussion of it? The new edition of eGaia is heavily updated, because the world has moved strongly in its direction since the first edition was published in 2002. We are far more closely connected now through social media, phones and tablets, and the starting points – projects and organisations – are far more developed. At the same time, with extreme weather, melting of the Arctic, and major financial problems, the need for radical change is much more obvious to people. I have tried to pull together the latest and best people’s work I could find on the problems, the starting points, the solutions, and key issues: is a collaborative world possible? How could it work? I invite you to help promote the ideas here. I keep meeting people who say that now is the time for the coming together of the starting points. Do you agree? Read eGaia or just the sample chapters Chapter 3 A taste of an eGaian future and Chapter 15 The next big step(s)? and help spread the word as widely as possible.